Only hours after his pre-assault breakfast of steak and eggs aboard an Assault Transport, still almost ready for inspection, Dwayne Boice, 3rd Battalion 5th Marines, burns out a North Korean weapons emplacement whose occupants couldn't accept what was happening. This 351' peak dominated the other major assault beaches, Red Beach to the North and Blue Beach to the South, which was why the capture of Wolmi-Do was the key to the entire Inchon invasion. This sandbagged gun pit was dug into rear of a slit trench. Table, bench and other items show how completely the sudden bombardment and assault came, for the defenders. 3/5's assault companies G and H, landed by LCVPs from the APDs (Attack Transports), quickly overwhelmed most of the North Korean defenders. But not all. Once the remnants partly recovered, they showered grenades down on I Company, 3/5's reserves, who came in the 3rd Wave and were mopping up in support. Unfortunately for the NK, Comstock (LSD 19) and Fort Marion (LSD 22) had also landed 6-M26 tanks and this flame thrower team, and they killed all NK who would not clearly surrender. On this day Wolmi-do, with its 200-yard "beach" of sand and rocks, its low-revetment and supporting ridge, its dominating peak and stubborn defenders fell. Seoul was 25 miles further inland. Ten bloody days of fighting remained before MacArthur would claim the capitol as again free. Seoul changed hands two times again during the next several months. But thanks to men like this Marine, Seoul is still free today. 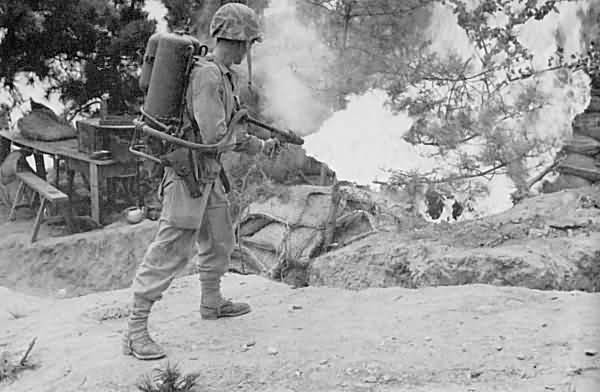 Although other nations deployed flame throwers in WWI the US only began in WWII. 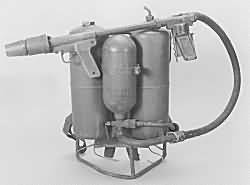 The napalm-gasoline fuel was propelled by a gas system of pressurized nitrogen, flow rate controlled by the rear hand grip. Leaving the nozzle the fuel was spark-lit by a battery-powered pyrotechnic ignition system controlled by the trigger in the front hand grip. The M2-2 and close variants, shown in these photos, were also used in the Korean War. 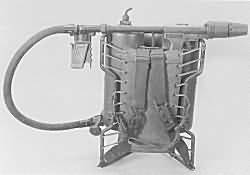 The M2-2 had a fuel capacity of 4 gallons and weighed approximately 70 pounds, fully loaded. The resultant stream of liquid flame could carry over 50 yards.